The martini is a classic cocktail enjoyed the world over by special agents and very interesting men (and women). It is also thoroughly subject to personal preference. My preference is extra dry and extra dirty. At Geeks Who Eat we have a soft spot for two things: tacos and martinis. We were inspired to experiment with these olives after a visit to the Queen Creek Olive Mill. The result was the Blue Eyed Girl. Since then, this drink has become a staple for us. What really makes this an excellent drink is the quality of the olives, our olive preference (as I mentioned above) are the olives from Queen Creek Olive Mill, especially their Maytag Blue Cheese olives and their Wasabi Ginger Sake olives (we use these in gin martinis). 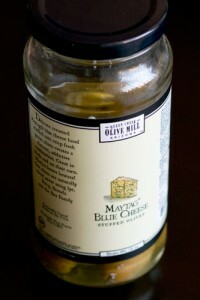 If you don’t have access to or time to order Queen Creek Olive Mill Maytag Blue Cheese stuffed olives, you can look for another blue cheese stuffed olive at the olive bar in your local grocery store. In a pinch we have used both Sprouts and Whole Foods; which are both good. 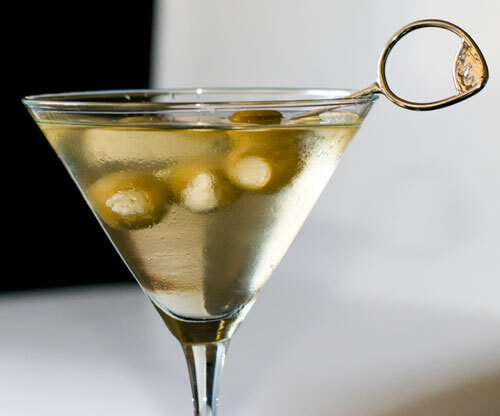 This cocktail works best with vodka because a spirit with more character would compete against the star of the show, the olives. You’ll also notice that little pools of oil will form on the surface of the drink. As you sip this delicious concoction, you will occasionally enjoy a burst of savory flavor. Recently at the AzCentral Food and Wine Experience, we had a chance to talk to Ross Simon, the proprietor of local cocktail parlour Bitter & Twisted. He had a few pieces of advice for us when it comes to martinis (we actually were picking his brain about Vespers, but his excellent advice applies here as well). He said when making a martini to not take your chilled glass out of the cooler until you have mixed your drink and are ready to pour it. In the time it takes to make a drink the glass will lose its cold to the touch feeling. This is a subtle clue to the imbiber that the drink is crisp and refreshing. The glass isn’t going to drastically change the temperature of the cocktail but subconsciously it is important. Speaking of the temperature of the cocktail, he also suggested to thoroughly shake it with ice, “until your hands are cold.” You can’t over shake your martini. I hope you’ve enjoyed this week’s 5 O’Clock Friday drink recipe as much as we’ve enjoyed perfecting it for you. We’d love to hear your thoughts on this recipe and ideas for future ones! Leave a comment below or find us on Twitter or Facebook and let us know! Combine the vodka, vermouth and olive juice in a shaker with ice. Shake until your hands are cold and pour into a chilled martini glass. 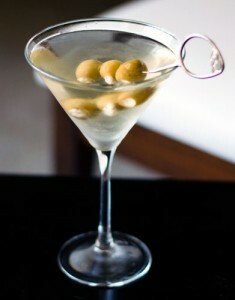 Garnish with not two, not four but three blue cheese stuffed olives.